Can I first off mention how many incredible places there are in Gettysburg, PA to take photos for my blog. Such a beautiful town! I love layering outfits for fall, I am all about being cozy and comfortable! I love the look of a chunky oversized cardigan paired with a feminine blouse. Let's be honest, sometimes those super chunky sweaters can look frumpy! Pairing it with a laced, floral, or ruffled blouse really brings a classier more feminine look. This cardigan is like toting around a snuggy, but a bit more classy. 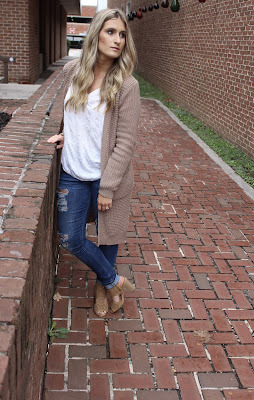 The air was brisk this day so this cardigan was the perfect transition piece for the fall weather. So I have to mention my distressed Jeans. These are my first ever pair of Express Jeans. I must say I am totally obsessed. I am super picky with my jeans, but needed to branch out from the same American Eagle Jeans I wore in High School (I have worn the same size for literally 10 + years). After hearing my best friend rave about these jeans, I finally caved. I'm hooked and will only ever buy my jeans from there. They are reasonably priced, fit true to size, and are so comfortable! Be sure to purchase their Jeans on a Sale! They are always running some sort of Jean Sale! Can we talk about these shoes?! Francesca's Shoe Game is Strong! These beautiful scalloped perforated sandals are so unique and are so affordable! They retail for $58. Again, I purchased mine on a sale and got them for under $50. I bought these with the intent of wearing them for some upcoming weddings, but I broke them out sooner. They are so comfortable! These are the perfect adjustment into the fall weather. Your feet are covered enough so they won't freeze, but are open and allow your feet to breath! The color is my absolute favorite. It literally compliments any outfit. If you don't follow me on my YouTube Channel, the link is at the top of my blog. I mentioned this polish in a recent Fall Essentials video! I love a Hunter Green Polish for the fall! My next post is all about my go-to Fall workout outfit! Check back later this week to see all the details! The system is simple, easy to operate, high efficiency and labor saving. The system consists of complete modules from raw water treatment stage to pure water completely finished, bottled bottled, automatic and semi-automatic bottle. In addition, the system is stable and safe for the user, with intelligent control circuitry, display of operating status and warning when trouble occurs, so users can be completely assured during transport. operating system.